Ah, home, sweet home. It feels good to be home after being away for so long. Sleeping in my own bed is going to feel amazing! The drive down the mountians was pleasently uncrowded thanks to it being Wednesday. The aweful heat has left for now (it was 103 when I left two weeks ago! ), and we're back in the low 80s. Love it! After unpacking, the first thing I sat down to was some stamping. Oh, how I missed my stamps and paper and ribbon! 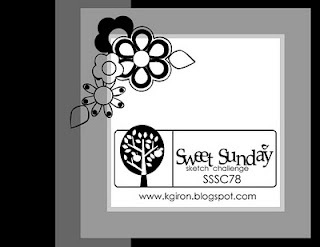 I going backwards in time with this card, using Karen's Sweet Sunday Sketch from last Sunday. It's too late to submit, but I sure love this sketch and needed to play! I'm also a few weeks behind on Maureen's WaCCky challenge, so I figured now was as good a time as any to dive back in. I skipped straight to this week's challenge, since the last two were absolutely stumping me (seriously, Maureen! It's killing me! lol). I pulled out some patterned paper to help speed things along. I am loving my Dotti Biscotti dp more and more every time I use it. I think the card is rather self-explanitory, so I'll skip ahead. A few pink jewels in the corners, some scalloped edging, and tea dye staining found this card complete. I did play around a bit with the embellishments in the corner... only buttons, flowers, and well, as you can see, I ended up with a ribbon/button combo. It was another great way to get some Ocean Tides on there (the sentiment is also stamped in Ocean Tides). This is so clean and simple and fantastic! I would have been stumped by those colors, but you made them work beautifully. And I adore the quote you used! Gorgeous card! Love how you put these colours together! The tea stains on the kraft are really pretty. Great accents!